The word 'autumn' usually conjures up images of brown leaves and nippy days, but in Cyprus you could almost believe it was still spring or summer with sun seekers soaking up the last rays on the beach or enjoying their drinking and dining al fresco. In fact, the telltale signs of autumn are more in the seasonal fruit and vegetables and the hint of Christmas preparations rather than the climate, so take advantage of the outdoors and explore Larnaka and its surrounding region. To help you on your way, this season's newsletter focuses on the sights of Kornos village, which you can discover with the help of a fantastic new map, and the new environmental centre in Skarinou, which offers a fascinating journey into rural Larnaka for all the family. If you are wondering when to plan your next trip to your favourite town, then our diary of all the major events for 2013 will help you decide, and if Larnaka is indeed your favourite destination, you too could win the award for being a loyal friend like 101 repeaters have. 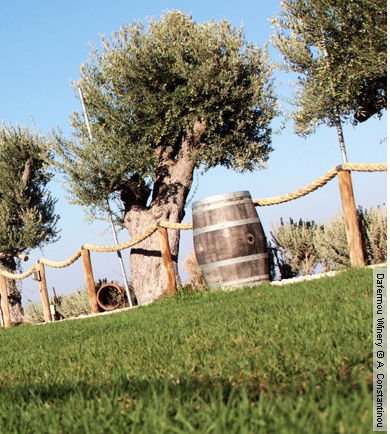 So, just like them, we hope you enjoy autumn in Larnaka over and over again! The 'Environmental Info Centre of Larnaka Mountainous Areas' in Skarinou, has opened its doors to the public and is educating guests about the significance of Larnaka's rural areas. The centre is an interactive experience with exhibits, a library and a lab where visitors can look through microscopes! The environmentally significant area itself is naturally abundant and provides a beautiful backdrop for nature walks, bird watching and cycling. Ship Ahoy on Larnaka's Port Roundabout! With the contracts recently signed for the spectacular revamp of the Larnaka port and marina, an impressive new ship sculpture on the port roundabout is heralding the future face of the area. The modern sculpture of a ship with sails is nearing completion, and all that remains is for the landscaping of the roundabout to be completed, which is estimated to be ready by the end of November. Larnaka is proud of its high quality beaches and we never stop in our efforts to keep them in top condition so that they are safe, attractive and well maintained. The most recent upgrade was at Pyla beach where the Larnaka Tourism Board, the Pyla Community Council and the Cyprus Tourism Organisation worked together to make this favourite beach strip more aesthetically pleasing and safer for beachgoers. Larnaka Celebrated World Tourism Day in Style! Larnaka celebrated its first World Tourism Day to great success on September 27, 2012, and gave visitors to the town a day to remember with a host of great events. World Tourism Day is an annual event that was created in 1970 by the UNWTO, and Larnaka really got into the spirit with a city walking tour, excursion to Lefkara, entrance to selected museums and a cooking demonstration by celebrity chef Tonia Buxton! When something needs to get done in Larnaka, you can always rely on the people of the town to come together in a show of unity and community spirit, as was the case on September 29, 2012, when around 100 volunteers – including the President of the Larnaka Tourism Board and the Presidents of Voroklini and Pyla Community Councils – all rallied together to get the beaches of the Larnaka-Dekeleia Road cleared. As the oldest city on the island and a town for all seasons, Larnaka has much to offer visitors, all of which it will be showcasing at the World Tourism Market in London between November 5-8, 2012. If you are visiting the exhibition, you will find the Larnaka Tourism Board at stand EM1100, and by passing by and filling in a prize-draw ticket you could be one of the five lucky winners who will receive a signed copy of Tonia Buxton's new cookbook! The hot summer months tend to draw in the largest crowds to Larnaka thanks to its beautiful beaches and a great selection of outdoor activities, but the town also offers a whole lot more the rest of the year round with some wonderful events and celebrations. 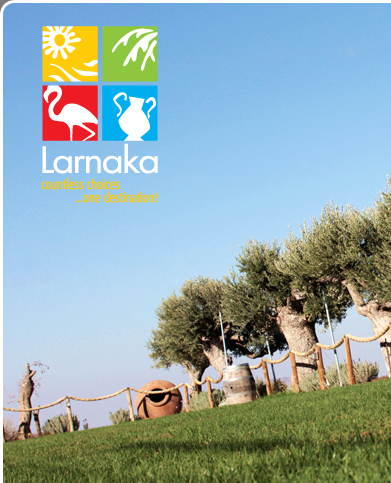 To help you plan your next trip and experience a different side of the Larnaka you know and love, check out and download the 2013 events diary. The picturesque village of Kornos has plenty of interesting sites and a new map comprehensively details everything you can see and do. The map – entitled 'Kornos, The Village of the Red Clay' - introduces the village and describes its main features such as churches, workshops, picnic spots, lakes, caves and even electromagnetic phenomenon. This map is a handy guide to a quaint village that is truly worth a visit, and can be downloaded here. The Larnaka Tourism Board runs the 'Larnaka's Loyal Friends Scheme' to award tourists who have visited the region more than 10 times. This time round, our long-standing friends hailed from England, Scotland and Russia and when asked why they love Larnaka, the general consensus was its great location, friendly locals, compact and convenient size, great beaches, facilities and amenities, and a sense of the 'real Cyprus'.